Safety leaders know and understand the importance of resilience with respect to organizational integrity. It can be the difference on a spectrum between adequacy, a functioning safety and environmental management system, and continuous improvement at the organizational level. Leaders in other functional processes across the organization benefit from these skills, although depending on role, the risk appetite can vary greatly. The “acceptable” risk level between an operational role and a compliance role, as many safety professionals will tell you, can be a stark contrast. The first skill, and perhaps the one all others are contingent upon, is the ability of personnel to identify a potential departure of a process from safety constraints. These departures have been identified as “drifts into failure,” and should trigger actions from safety leaders. This skill is exercised in real-time, but there’s also a forward-looking component to it. Managers have to be able to process this information, form a mental model of the situation and cognitively construct possible trajectories of how the situation may change. For example, knowing a sequelae of events which will occur if actions are not appropriately escalated to ensure a return to safe operation. Once the safety leader has identified that the situation has (or is about to) departed from acceptable safety limits, the next step is to develop an action or set of actions to return the process to a safe operating envelope. This action(s) is guided by the resources and constraints available to the safety leader with consideration given to operational priorities and goals. Depending on the culture of the organization, this step can be fraught with peril for managers. Collaborative decision making should be viewed through the context of those who have the highest exposure to the impact of the risk. Often times, these decisions involve significant trade-offs when competing priorities or organizational goals/objectives are present. Out of the three skills presented, assertiveness is often times the most difficult to master in most organizational environments. Time and time again, incident investigations reveal human factors (human nature, really) where subordinates failed to effectively challenge and engage managers when personal or process safety conflicted with operational or production goals. Managers and safety leaders can get caught between these organizational safety pinch points. Assertiveness can have profound implications on careers, especially if one is perceived to be “over assertive.” Compounded with organizational pressure to meet operational / production goals, some managers can be moved to such to a state of stress over these communication challenges it will adversely affect their ability to develop and execute good decisions. These three skills form a base for ensuring that safety (and other) leaders are able to help build resilience into organizational management system, especially in decentralized or remote environments. 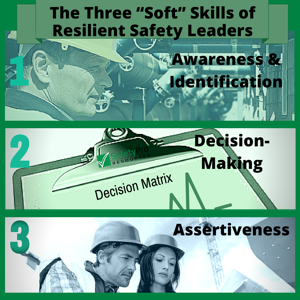 Providing a safe environment for the development of these skills is paramount to ensuring the resilience of safety leaders. For more tips on effective safety leadership, download our free safety managers guide to effective safety training.